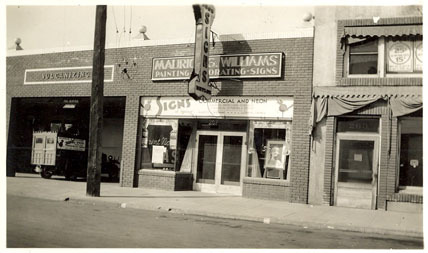 Maurice G. Williams established Williams Sign Co. in 1930, after acquiring a sign shop from Tim J. Weaver, who shared space in the same building at 256 E. First Street, Pomona, CA. when Maurice was a painting contractor. Maurice saw an opportunity to develop a business where he could use his creative talents for design and advertisement in the Pomona area. In the mid 1930’s, Williams Sign Co. promoted the neon-illuminated signs, which were produced at the time by Metlox Signs of Manhattan Beach. When Metlox Signs neon patent expired, Williams Sign Co. was able to manufacture their own neon signs. In 1938 their final move to, 111 S. Huntington St., Pomona took place, which broadened their manufacturing capabilities, such as cabinet signs, wall signs and pole signs. Maurice’s son Jay Williams, joined the company in 1945, after his discharge from the US Air Force as a pilot. Jay concentrated on mastering the manufacturing of all custom signs and the servicing side of the business. He also learned the art of the neon tube bending and manufactured neon signs. While his father concentrated on the sales and the design end of the business. Some of the well noted vintage signs that were manufactured in the late 40’s and early 50’s were for the LA County Fair. These reminders of a bygone era included the ultra modern Flower and Garden sign, the Grandstand Marquee and the most spectacular of all the Fun Zone arch a multicolored rainbow of glowing neon reaching 100 feet across, standing 40 feet high and accented with neon colored letters, stars and musical notes. Jay’s daughter Sharon Willison joined the company in 1987 and Sharon’s son Chad Bruce started learning the sign business in 1989, following his grandfather’s footsteps. At one time there were four generations working in this office, which was quite remarkable. 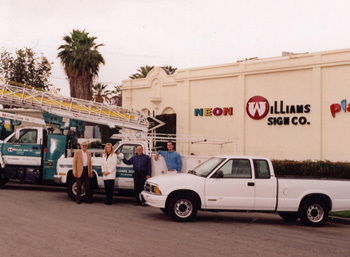 There have been numerous changes in the sign industry throughout the years and generations which you can check out on our website or stopping by our office. Williams Sign Co. takes pride in its heritage and continues to grow with the times of new technologies to produce a quality product for its customers. We look forward to working with our customers as a team to achieve the advertisement needs they are looking for.